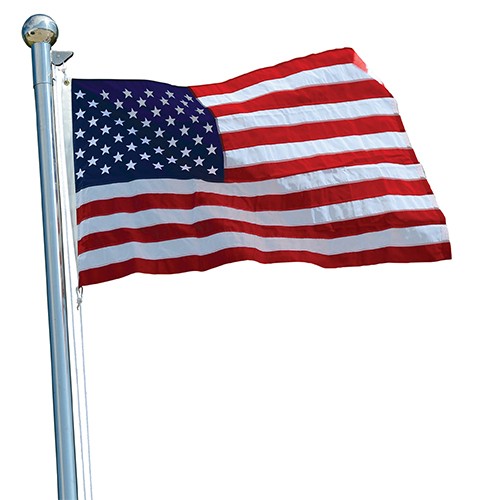 Flagpoles feature a bright-polished stainless steel finish to elegantly display your flag of choice. The one-piece stainless steel tapered construction will maintain its attractive finish for many years to come. Includes nylon rope, stainless steel rope cleat, and top pulley. Base plate is pre-drilled with four mounting holes. Flag poles are rated for 60 mph wind. NOTE: Width of flag should not exceed 25% of the flag pole height. American Flag made for 20' foot flagpoles. American Flag made for 25' foot flagpoles.